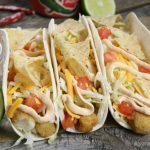 Soft flour tortillas are filled with breaded fish sticks, fresh lettuce, tomatoes, cheese and crunchy lime tortilla chips then drizzled with some mild Jalapeño Greek Yogurt Dip, creating the most amazing fish tacos! The idea of fish tacos just hit me when I was passing by the Greek yogurt dip at Costco. It happened to be on sale then so I went ahead and purchased a container, hoping to make some fish tacos from it. After trying the combination, I was so pleased in how they turned out! The lime chips are a must, they taste absolutely amazing and add some nice crunch to the other soft ingredients. The jalapeño dip is not too spicy, quite mild if you ask me and it pairs so beautifully with fish making this a far better sauce than tarter in this case. Try these out they will sure be a hit! Bake breaded fish sticks according to package instructions. 2. To prepare taco’s assemble in the following order; soft taco, 2 fish sticks, cheese, tomatoes, chips and sauce. To prepare taco's assemble in the following order; soft taco, 2 fish sticks, cheese, tomatoes, chips and some drizzled jalapeño greek yogurt over the top. Dip tacos in the greek yogurt dip if desired.